On September 19th, 2018, Grand Chief Dr. Abel Bosum convened a meeting with representatives from the Cree Nation Government’s Environment and Remedial Works Department, Niskamoon Corporation, Cree Trappers’ Association, Cree Hunters and Trappers Income Security Board and James Bay Eeyou Companee to discuss the organization of a conference in Chisasibi on November 14th and 15th, 2018. 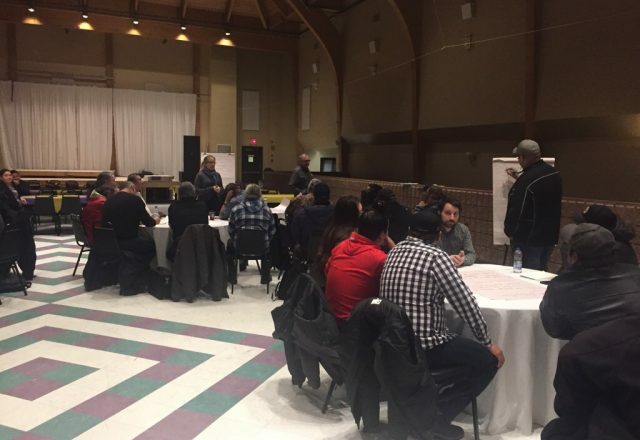 The conference’s aim was to bring together representatives of all Cree entities, communities, and associations to exchange ideas on how we can work together to improve the lives of Cree Hunters and Trappers in Eeyou Istchee. This event brought together over 90 participants from the Cree Nation communities and employees from regional entities. Presentations were made on the first part of the day; entities shared information, and presented their administrative structures and programs available to the Eeyou population. Round Table discussions took place on the afternoon of the first day and on the second day; the participants were posed questions to identify the important issues and were asked to begin finding solutions. Towards the end of the day, the facilitators of each of the (6) tables presented the results of the discussions of their Round Table and suggested the next steps.